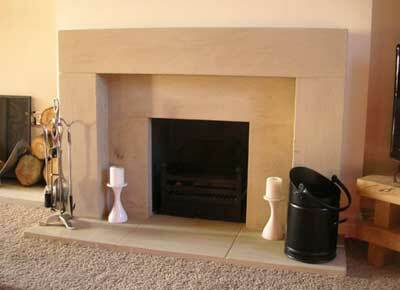 We can supply stunning stone fireplaces, stone mantels and hearths made from natural yorkstone from our quarry in Yorkshire. 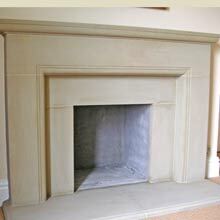 These hand carved bespoke stone fireplaces can be custom-made from diamond-sawn yorkstone or natural riven yorkstone. 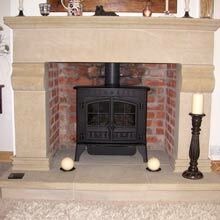 Each stone fireplace is individually hand carved to the customers own requirements from unique pieces of yorkstone and dimensions can be tailored to meet your exact requirements. Don't limit yourself to what you can see on this page, but the examples may help you make your own fireplace design. Natural yorkstone is a beautiful buff colour that complements any interior design scheme. 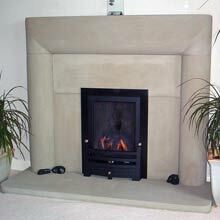 It can be used with any type of wood-burning, solid fuel, gas, electric or enclosed stove fire. 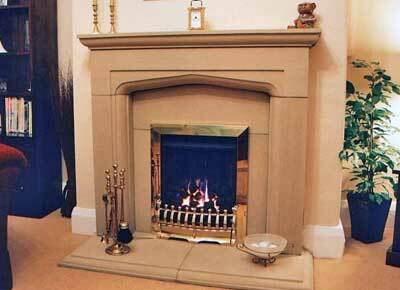 To order yorkstone fireplaces or for more information on prices, sizes, availability and delivery options please contact us. All phone calls and email enquiries will be dealt with by the owner to give the customer the satisfaction of knowing they will get the undivided attention they expect.